Omega-3 fatty acids are a special class of polyunsaturated fatty acids which are commonly found in plant seed oils, nut oils and oily fish such as sardines and salmon. A large number of scientific studies worldwide have highlighted the multiple benefits of dietary Omega-3 fatty acids in areas as diverse as heart, brain, and normal vision. The two most researched Omega-3 fatty acids are Docosahexaenoic Acid (DHA) and Eicosapentaenoic acid (EPA). DHA contributes to the maintenance of normal vision1. Omega-3 fatty acids play an important structural and functional role in the retina, the part of the eye that detects light. DHA is a component of photoreceptor cells which are responsible for converting light into nerve signals. Photoreceptors contain the highest concentration of DHA of any cell in the body, with DHA accounting for over 50% of the total fatty acid content2 3. Adequate levels of DHA must be maintained for the retina to continue to function properly and to maintain normal vision)4 5. The retinal cells are continually being renewed, so a constant supply of Omega-3 fatty acids and in particular DHA is required6 7. Since these cannot be made by the body a lack of these in the diet can have a direct effect on levels in the retina8. Fortunately increasing dietary intake can help to restore retinal Omega-3 levels9. Omega-3 fatty acids are now being recognised as being essential for normal eye health from before birth continuing into old age10. The macular is the central area of the retina, and contains the highest density of photoreceptors. The retinal cells of the macular are particularly vulnerable to the effects of UV rays in sunlight which can result in cellular damage11 12. Because of this, sunglasses with a high Eye-Sun Protection Factor (E-SPF) are always recommended to reduce the exposure of the eye to excessive light and harmful UV rays. Visionace Plus provides vitamins C and E plus minerals zinc and selenium which contribute to the protection of cells from oxidative stress. Lutein belongs to a class of compounds called carotenoids and is the dominant pigment in the retina. Visionace Plus provides a total of 12mg of Lutein Esters. Only the purest pharmaceutical grade fish oil is used in Visionace Plus. To ensure maximum benefit, the oil is carefully concentrated to increase its DHA and EPA content and further purified. Each batch is rigorously tested, certified, and fully compliant with stringent EC and WHO rules on environmental pollutants. 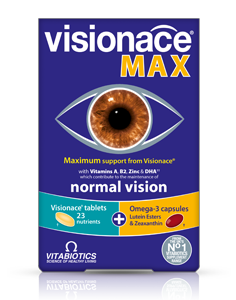 Visionace contains high quality natural Lutein Esters. Visionace also contains a comprehensive range of vitamins, minerals and nutrients, such as copper and selenium which support the normal functioning of the immune system, and thiamin (vitamin B1) which contribute to the normal function of the heart. An additional multivitamin is not required. Which Visionace formula is right for you? Visionace is used by leading optometrists and eye care specialists in the UK and is available from larger Boots, Superdrug, Waitrose, health stores including Holland & Barrett. Alternatively you can order online here. 1The beneficial effect is obtained with a daily intake of 250mg of DHA. Vitamin C (Ascorbic Acid, Carrier: Glyceryl Tristearate), Bulking Agents: Microcrystalline Cellulose & Dibasic Calcium Phosphate, Magnesium Oxide, Vitamin E Natural Source (as D-Alpha Tocopheryl Acid Succinate) (from Soya), Lutein Esters & Zeaxanthin Esters (Carriers: Sugar, Antioxidants: Natural Vitamin E & Ascorbyl Palmitate, Cellulose Gum), Zinc Sulphate, Tablet Coating (Hydroxypropylmethylcellulose, Hydroxypropylcellulose, Caprylic/Capric Triglyceride, Natural Source Colours [Titanium Dioxide, Iron Oxides]), Pantothenic Acid (as Calcium Salt), Citrus Bioflavonoids, Anti-Caking Agents: Stearic Acid, Magnesium Stearate & Silicon Dioxide, Thiamin (Vitamin B1 as Mononitrate), Niacin (Nicotinamide), Ferrous Fumarate, Betacarotene (Starch, Water, Antioxidant: DL-Alpha Tocopherol), Vitamin B6 (Pyridoxine HCl), Bilberry Extract, Manganese Sulphate, Cross-linked Cellulose Gum, Riboflavin (Vitamin B2), Hydroxypropylmethylcellulose, Vitamin A Acetate [Carriers: Gum Acacia, Sucrose, Starch, Tricalcium Phosphate, Antioxidant: DL-Alpha Tocopherol], Copper Sulphate, Vitamin D3 (Cholecalciferol [Carriers: Acacia, Sucrose, Corn Starch, Medium Chain Triglycerides, Antioxidant: DL-Alpha Tocopherol]), Folic Acid (as Pteroylmonoglutamic Acid), Sodium Selenate, Chromium Trichloride, Potassium Iodide, Vitamin B12 (Cyanocobalamin). Allergy Advice: For allergens, see ingredients in bold. Omega-3 Fish Oil (High DHA Fish Oil) (from Fish), Capsule Shell (Pharmaceutical Grade Gelatin [Halal Bovine Source], Glycerin, Natural Source Colour [Red Iron Oxide], Flavouring: Lemon Oil), Lutein Esters (Carriers: Vegetable Oil, Natural Vitamin E). Allergy Advice: For allergens, see ingredients in bold. ONE TABLET (AQUA BLISTER) PER DAY, PLUS ONE CAPSULE (PINK BLISTER) PER DAY. Swallow with water or a cold drink. Not to be chewed. Do not exceed recommended intake. Only to be taken on a full stomach. Can be continued for as long as required. This comprehensive formula replaces other Visionace supplements and multivitamins. There is no need to take an additional multivitamin. Food supplements must not replace a varied and balanced diet and a healthy lifestyle. As with other food supplements, consult your doctor or pharmacist before using if you are under medical supervision, pregnant, breast-feeding, have epilepsy, a thyroid condition, haemochromatosis, suffer from food allergies, or are allergic to any of the ingredients. Made in a site that may handle nuts. Allergy Advice: For allergens, see ingredients in bold. This product will not affect the lens prescription required in long and shortsightedness and astigmatism. Why has Visionace Plus been developed? When is Visionace Plus recommended? 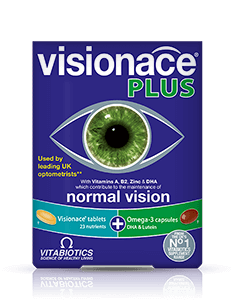 How pure is the fish oil in Visionace Plus? Can Visionace Plus help with conditions such as Glaucoma and 'Floaters'? Can Visionace Plus be used simultaneously with medications? Will Visionace Plus have any effect on lens prescriptions required in long and short sightedness and astigmatism? How many tablets and capsules does one pack of Visionace Plus contain? How and when should Visionace Plus be used? Are there any undesired effects whilst taking Visionace Plus? Need help swallowing a tablet or capsule? Is Visionace Plus suitable for vegetarians? "The Visionace Plus really do help, brilliant product."" "After 2 months use of the Visionace tablets the eye specialist noted improvement. Highly recommended product." "A local doctor recommended Visionace for my eye health. i feel so happy now and personally thank Vitabiotics and recommend the product to others"
"I’m a natural cynic so I don’t know what I was expecting when I purchased Visionace in June! My eyesight felt worse when I was tired. After taking Visionace for a month, I turned around to my wife and said “look at the colours in the garden-they’re really vivid!”. My wife looked at me as though I’d been drinking! But the colours seemed really ‘rich’ in a way I’d not noticed before. Also, my night sight was struggling me- all the colours fused into a fog (without specs). I’ve now noticed that detail is better at night. I can see individual house bricks from a distance, whereas before it was just a wall. From a cosmetic perspective, I’ve never had such healthy looking ‘whites’ of my eyes. I’m a hardened cynic believe me, but your product works!!!" "Recently visiting the UK I took these tablets that I had never heard of before - they were wonderful. Am ordering some from down under!" Always read the product directions before use. Do not exceed the recommended intake. As with other food supplements seek professional advice before using if you are pregnant, breast-feeding or suffer from food allergies, and consult your doctor or pharmacist if you have an underlying medical condition, or if on medication. Vitamin supplements are not intended to treat or prevent any disease. Food supplements must not replace a balanced and varied diet, and a healthy lifestyle. Do not take if you are allergic to soya.